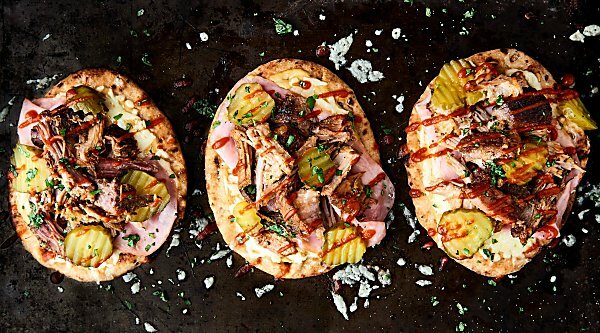 These mini cuban naan pizzas might just be the easiest dinner yet! 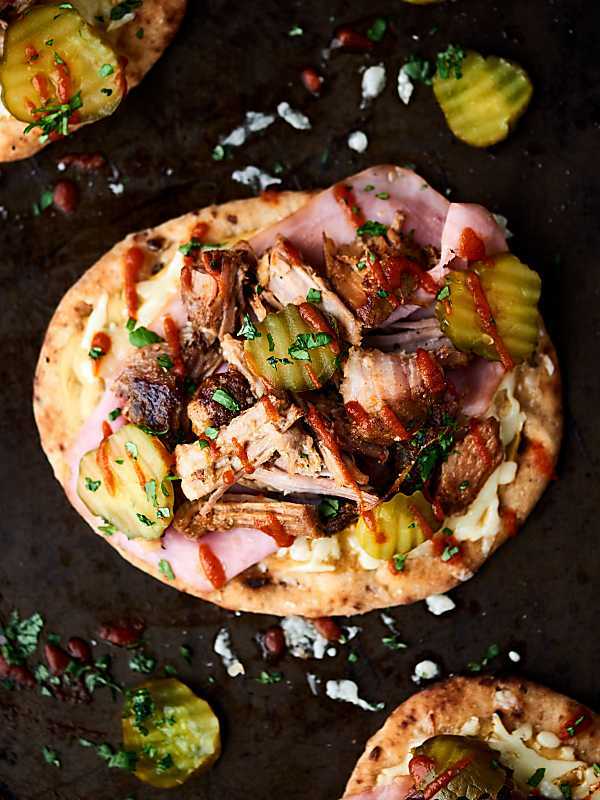 Slow cooker fresh pork roast paired with ham, naan bread, swiss cheese, mustard, and pickles! 15 minute dinner. Today’s recipe is sponsored by our friends at Smithfield! I took a classic sandwich and turned it into pizza . . . made with mini naans. It’s the ultimate mash up! 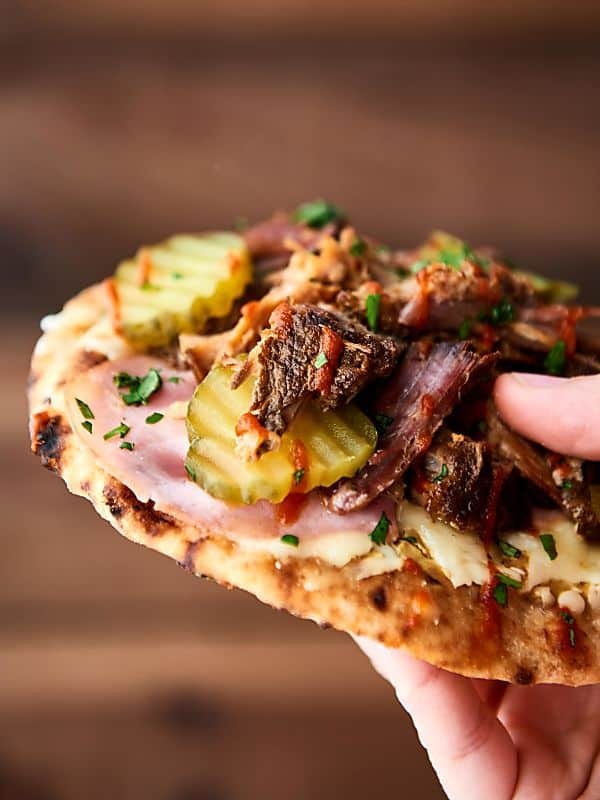 Tender fresh pork, thinly sliced ham, tangy pickles, stringy swiss cheese, and fluffy naan <– Oh my yum. In case you missed it, here at Show Me the Yummy, we’re all about Easy Recipes for Yummy Food. 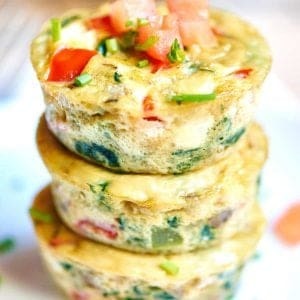 Who doesn’t LOVE easy recipes that taste delicious? Today’s recipe totally fits the bill. The main event? Smithfield Sweet & Smoky Marinated Fresh Pork Roast. Once you get home from work, you’re literally 10-15 minutes away from getting dinner on the table. Step One: shred the pork roast. Step Two: lay out mini naan bread on a baking sheet. Step Three: spread dijon mustard on the naan. Step Four: add some cheeeeese <– swiss, please! Step Five: layer on sliced ham. Step Seven: bake until the cheese is melty and delish. Step Eight: throw on some pickles and maybe a little drizzle of hot sauce and a sprinkle of cilantro. Step Nine: eat allllll the mini cuban naan pizzas. Like. We’re seriously obsessed with these. 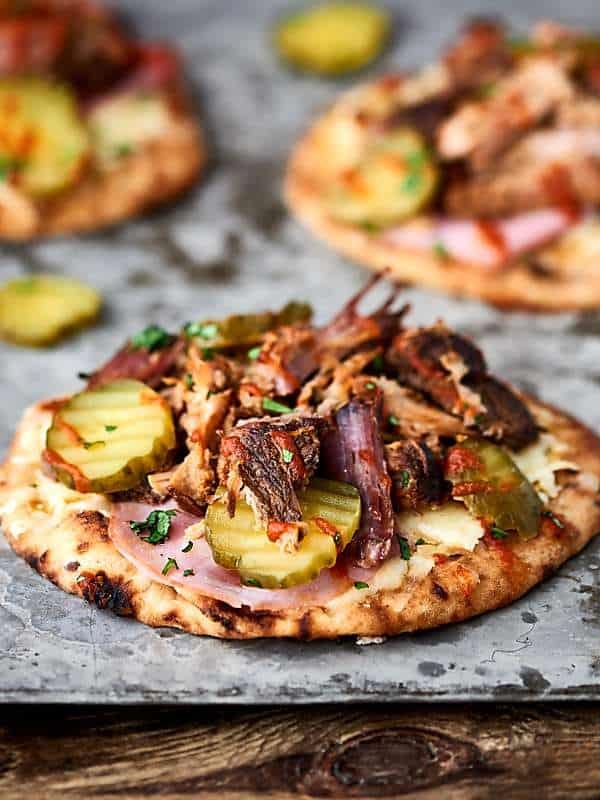 You can’t get easier than this and I just LOVE the combination of sweet and smoky pork, gooey cheese, fluffy naan, savory ham, and tangy pickles! Do you want more easy recipes using this pork? Show Me the Yummy! These mini cuban naan pizzas might just be the easiest dinner yet! 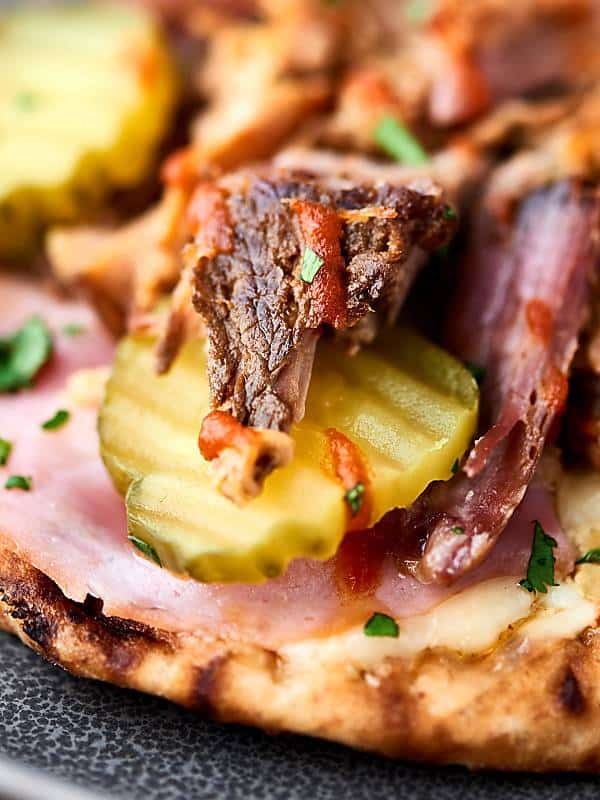 Slow cooker pork paired with ham, naan bread, swiss cheese, mustard, and pickles! 15 minute dinner. Cook fresh pork roast according to package directions. Shred cooked pork roast directly in your crockpot. Preheat oven to 350 degrees F and line a baking sheet with a silicone baking mat or parchment paper. Place naan onto prepared baking sheet. Spread naan evenly with dijon mustard, then layer on cheese, ham, and pork. Bake in preheated oven for 5-10 minutes, or until cheese has melted. Top with pickles, hot sauce, and cilantro. 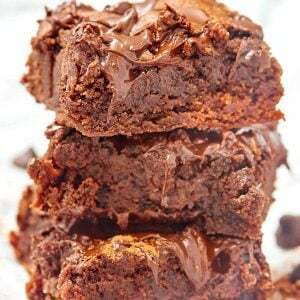 This recipe can EASILY be doubled, tripled, etc. 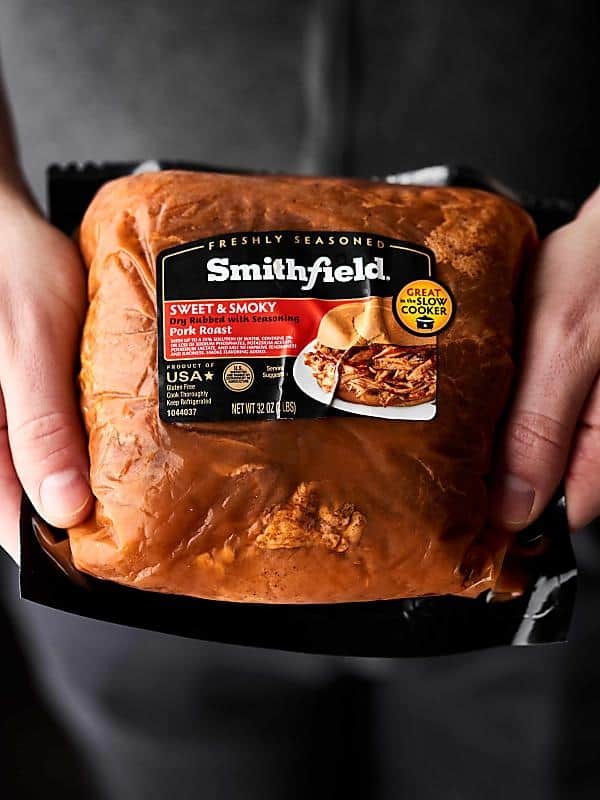 Thanks again to Smithfield for sponsoring today’s post! These little pizza bites are so awesome! Love a naan pizza and this idea is great! Naan is my fav and these are right up my alley! YUM! Thanks Tieghan! Naan is the best! Love Smithfield products! This looks like one awesome pizza! OMG! These are making me drool!! This is so awesome and looks so tasty.